Senior Yemeni general believed to have been taken prisoner in the latest attack on security forces by Islamist terrorists. 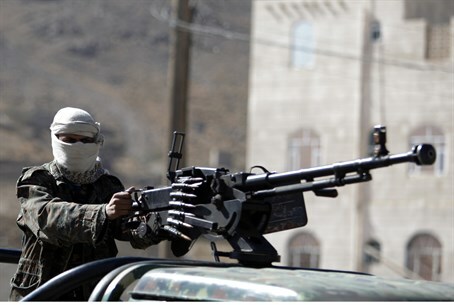 Al Qaeda terrorists have seized a military HQ in the Yemeni port city of Mukalla, killing two soldiers and taking an unspecified number hostage. According to a military official cited by Al Arabiya, the base was taken after a suicide bomber rammed a car packed with explosives into the entrance, clearing the way for four more vehicles packed with Islamist fighters, who were apparently disguised as Yemeni special forces. Among the hostages is believed to be General Muhsen Hasan, described as the commander of the army's second military region. The military official said reinforcements from the Yemeni security forces had already arrived and "engaged" with the terrorists, promising that the terrorists responsible would "pay a heavy price" for the attack. The Yemeni affiliate of Al Qaeda - Al Qaeda in the Arabian Peninsula (AQAP) - is regarded as the most dangerous branch of the terrorist franchise by the US government, which has waged a campaign of targeted drone-strikes against its leadership. AQAP is responsible for a number of attempted terrorist attacks against US and other western targets - including plans to attack American interests in the Middle East and North Africa, which resulted in the closing of some two dozen US embassies throughout the region. AQAP and its affiliates have control of swathes of territory in Yemen's southern badlands, and has waged a long insurgency against the army and government forces. On September 20, Al-Qaeda fighters killed at least 56 soldiers and police in coordinated dawn attacks in Shabwa province, in the deadliest attack on Yemeni forces since the government retook a number of towns from the group in a major operation last year.